Hurraw unscented balm is nut-oil free and mild; it contains no added flavour. This balm contains over 60% cold pressed meadowfoam seed oil grown in Oregon’s Willamette Valley. Meadowfoam seed oil is a superstar moisturiser loaded with the antioxidant Vitamin E.
A smooth, creamy-like-butter nothingness. Sometimes nothing is really something. 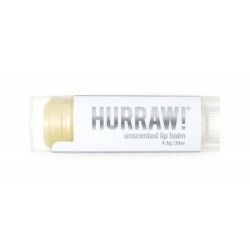 The unscented balm does have a mild scent of natural-ness; all of Hurraw's ingredients are cold pressed and un-filtered. To use: Apply to lips throughout the day.